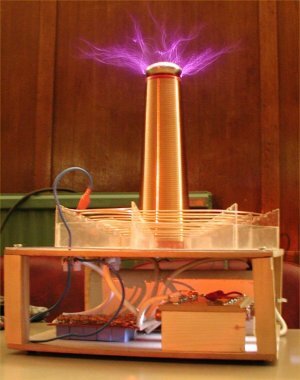 Apart from the looks, Cotton Tess is a fairly traditional tesla coil. 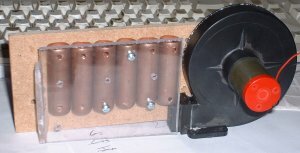 A 6kv 20mA NST powers the coil. The output of the NST is fed through two 10T ferrite torrid filters into a copper tube type multiple spark gap. 3 Gaps are used giving a spark gap of around 3mm. 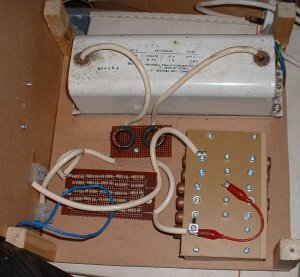 Across the primary is an MMC type capacitor made from twenty five 0.1uf 440Vac rated capacitors in series, with 10M spreader resistors across each capacitor. 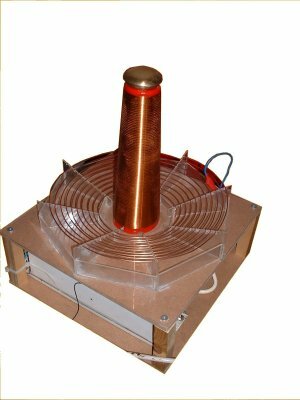 The Primary coil is wound from 2.5mm copper wire super glued onto an acrylic framework, A crock clip allows the tap to be varied. The Secondary is wound with 0.25mm diameter enamelled wire on an old industrial cotton reel and has 950 turns. The top load is a 1.5" diameter brass doorknob, with the lacquer removed and re-polished. The whole lot resonates at around 750Khz and gives 4-5" streamers and arcs up to 8". It was built in around 48 Hours (after sourcing all the components) and pretty much worked first time.